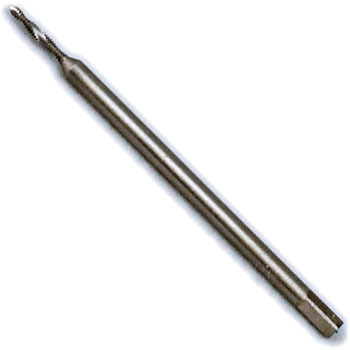 Spiral taps are very helpful because they reduce the torque when cutting a screw. This review is about item#6750441. I am thankful that there is a case. The usability is usually good. This review is about item#6750484. As chips were coming up, I could use it with confidence compared with the tap on hand. I am very satisfied. This review is about item#6750396. Normal processing uses another product, but it is a necessity of tap processing of difficult to cut material and stainless steel because it is excellent. This review is about item#6750545. Precision thread cutting can be carried out reliably, finished without screw rattles, and it can be used for a long time as a tap. This review is about item#6750633. I used it to make a jig for checking the hydraulic system equipment of a car. It was very sharp. Compared with general trench type taps, it seems that the excretion of the facet is good. This review is about item#6750642. There are also many times of use, but in particular this is not a problem at present. This review is about item#6750685. Although it may be a monotary product, it is small in size. So, I made it to this. Because it is cheaper than group tapping. This review is about item#6750466. I made a purchase to cut the set screw by my own T slot nut. M10 thought that it would be difficult to get rid of it, and with good sharpness the discharge of kiriko was also very satisfactory, but if the range of incomplete threaded part of calling was a little narrower it was a five star. This review is about item#6750624. Although the width of the chip escape was larger than the diameter of the tap, there was also anxiety, but with a thickness of about 3 mm, the bottom hole of 1.6 mm was opened in the 6000 series aluminum plate. With this 2 mm tap, one screw could not be cut It is the lowest item that breaks into. Considering the trouble of removing the cutting edge that bites into the eyelet, it is better to cut out the other piece, but I do not want to buy the product of the manufacturer here even in the DIY work leaving it to no time. This is an honest impression. This review is about item#06750441. Although it was discharged when the clipper was discharged in the item explanation, it got stuck in the groove and it was somewhat frustrating but it got drowned. I thought that the spiral tap (non-coated item) of YAMAWA used before this product was better. This review is about item#06750563. It was sharp and good for the stainless steel material without occurrence of muscle etc. It was about 50 processing, so I would like to try it again at the next mass production. This review is about item#06750511. This review is about item#06750536.